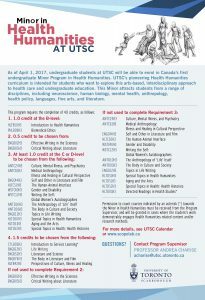 As of April 1 2017, undergraduate students at UTSC will be able to enrol in Canada’s first undergraduate Minor Program in Health Humanities. Links to the UTSC Calendar will be updated as they are made available. The information that follows is for students’ planning purposes, and may reflect updates that do not yet appear in the UTSC Calendar. **Please note this page will be updating in Spring/Summer and occasionally throughout the academic year; if you have questions regarding specific courses or eligibility for the Health Humanities Minor, please contact Program Supervisor Prof. Charise directly. Current and past Special Topics courses (C- and D-level) are listed here. The Minor in Health Humanities provides an interdisciplinary exploration of human health and illness through the methods and materials of the creative arts, humanities, and critical social sciences. Students’ understanding of the humanistic, philosophical, historical, and artistic study of health—past and present—will be developed by attending closely to how literature, philosophy, history, and critical social sciences reveal the aesthetic, ethical, and multicultural contexts of health, disability, medical research and policy. This interdisciplinary Minor is open to all undergraduates regardless of major or disciplinary background. Students will note that some courses at the B-, C-, and D-levels may have additional pre- requisites; therefore, students selecting the Minor as a Subject POSt must choose their courses carefully to ensure that they have the necessary prerequisites. Permission to count courses indicated by an asterisk (*) towards the Minor in Health Humanities must be received from the Program Supervisor, and will be granted in cases where the student’s work demonstrably engages Health Humanities-related content and/or research methods. Note: Relevant Health Humanities-related courses selected from other academic units and disciplines, not already listed below, may be approved for the Minor in Health Humanities on a case-by-case basis. Note: These groups of courses engage methods, content, and/or issues relevant to arts and humanities based approaches to health. They provide students with the opportunity to explore more specialized topics related to Health Humanities based on their academic interest and professional aspirations. Permission to count courses indicated by an asterisk (*) towards the Minor in Health Humanities must be received from the Program Supervisor, and will be granted in cases where the student’s work demonstrably engages Health Humanities-related content and/or research methods. Questions? Contact Program Supervisor Professor A. Charise (acharise@utsc.utoronto.ca).